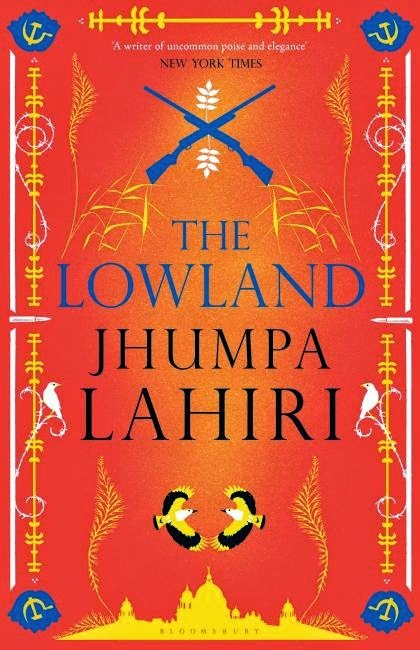 I've had Jhumpa Lahiri's The Lowland for around a year, and was finally prompted to read it by its inclusion on the shortlist of the Baileys Women's Prize for Fiction, and wow, am I glad I did. Brothers Subhash and Udayan grow up in Calcutta in a loving and supportive family. As they get older Udayan finds himself drawn to the Naxalite movement, a rebellion against the poverty and inequality some in India have to live within. Udayan's involvement will change his life, and Subhash's, as well as the lives of their family, for years to come. The Lowland starts out as a family tale, showing us the relationship between Subhash and Udayan, two boys having fun and getting educated in the relatively newly formed India. Lahiri clearly sets out the stall for the rest of the novel in the first few chapters - this is a story about the love and bond between two brothers. I enjoyed The Lowland from the beginning, but it went from being a good book to an outstanding book when something massive happened part of the way through. Suddenly, in one line, in two sentences, in seven words, the whole book changed and took on a new depth and seriousness. From then on, I just found myself addicted, wanting to know what would happen and what had happened. At the same time, I wanted to read The Lowland in the way I watch scary films - squinting, knowing that what was coming next would hurt. Hopping between India and America, Lahiri manages to create a sense of both places. India is chaotic and hot, while America is ordered and cool. Yet as characters move between the two countries, they take with them pieces of each, just as each country becomes a piece of the characters we meet. I was enamoured with the way Lahiri created characters with layers which had to be unpeeled away one at a time. Guilt could be seen hovering beneath the surface of numerous characters, but Lahiri's structure and storytelling prowess meant I was willing to wait to find out what caused that guilt. I also loved the way Lahiri weaved in the history of India into The Lowland. I'd never heard of the Naxalite movement before, but reading The Lowland has made me want to go away and find out more. Not only that, it's a movement which is echoed in so many struggles going on around the world, from the Arab Spring to the current Ukraine/Russia situation (although that's just coincidence). The Lowland is mainly such a good book because it's a book that hurts to read. I felt my heart crack numerous times throughout my reading of the novel, making me wish the story would continue until it got to a happy ending while simultaneously making me wish it would stop so I could stop being so sad. But far from being a book I wouldn't want to read, the fact that it created such feelings within me just made me love it more. Forget easy reads, read The Lowland, because it makes you feel. How I got this book: From a friend.